Over the last hundred years or so, large cities and their surrounding housing suburbs have grown, replacing countryside habitats. Many species of birds have disappeared from such areas, but a few birds have adapted themselves to the man-made environment and have survived very well indeed. Everyone sees birds every day - in the garden, in the street, in the park and, of course, in the countryside. Keen ornithologists travel to well-known areas to see unusual birds; estuaries, reservoirs and wetlands, for example, but we often take for granted the wealth of birdlife on our own doorsteps. Most of us live in towns and normally trees, gardens and parks are not far away. Many types of birds are common in cities and it is worth considering just why they have become urbanised. The three commonest city birds are the starling, sparrow and pigeon. They are three very adaptable species, always ready to exploit a potential food source or a suitable nest site. Starlings are sociable birds - they congregate in their thousands and fly to suitable roosts. 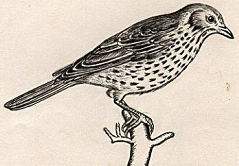 When large numbers are roosting in woods the trees can become so saturated with the birds' droppings that they may die. In the winter the town or city offers roosts which may be one or two degrees warmer than the country roosts and when that extra warmth may mean the difference between survival or death, it is obvious why so many thousands of roosting birds choose the city to spend the cold hours of the night. This causes problems to man; the accumulated droppings of many thousands of roosting birds over a number of weeks can constitute a serious health hazard. A satisfactory method of repelling the birds has yet to be found - even firing guns to frighten them away does not seem to work! 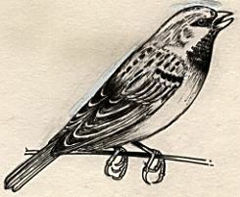 The House sparrow, found in all towns and cities, was first attracted to our streets when the only form of transport was horse-drawn. The sparrows fed on the spilt grain in the streets and lived around the stables, common all over the city. Now that the internal combustion engine has taken over our transport system, the numbers of urban house sparrows has declined. 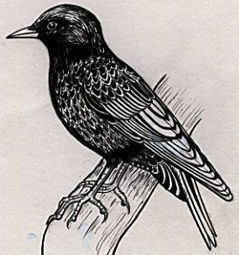 Although it is the probably the most well-known British bird, it is not as common as the blackbird, chaffinch or wren. The common town pigeons we see around us every day have descended from the wild Rock dove found around the coasts, but the city birds were descended from domestic pigeons which escaped from medieval dovecotes. The Rock doves are a cliff-nesting species as are the town pigeons but they have exploited the ledges and parapets of city buildings, using them in the same way as they would the cliff ledges. The abundance of food, the artificial light and the comparative warmth of the towns also means their breeding season is extended. The starling, house sparrow and town pigeon are all sociable birds which have successfully exploited man's food and buildings - in fact , they would probably not be able to survive in such large numbers without man! Several other species of birds also live within our urban areas, making use of our gardens, parks and waste ground. The original habitat of these birds was woodland or hedgerow, but because these countryside habitats have been decreasing over the years, many birds have found refuge in our towns and cities. These 'song birds', such as blackbirds, thrushes and robins, are territorial, which means that each pair of birds needs a patch of land which will provide enough food for them and their babies. The food these birds eat includes worms, snails, caterpillars and other minibeasts, which all need a good mixture of plants in order to thrive. If you hear one of these birds singing on a town site, it is a sure indication that there is a good balance of nature in that area. Our gardens can provide the rich habitat that these birds need. Look Out Also for several other interesting birds which you may spot in an urban area. 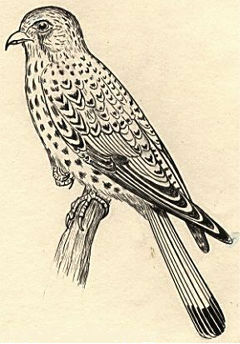 The kestrel is a bird of prey that has colonised our towns and cities. It even nests on tall buildings and may be seen hovering as it searches wasteground and allotments for mice and voles - it will also hunt house sparrows. During the summer months house martins and swifts may be seen swooping through the air between buildings. They are not territorial but depend on buildings for nesting sites and need a good supply of flying insects for food.